What I never forget about the Fourth Konko-sama, the former Spiritual Leader of the Konko Faith (Konkokyo), is an episode I had when I was an eighth grader. One day, I went to the Konkokyo Headquarters and asked the Fourth Konko-sama to conduct Sacred Mediation for me for the first time in my life. I love music, and I gradually came to want to learn tengaku or musical instruments for Konkokyo ceremonies. Back in those days, tengaku training sessions were given at the Sacred Grounds of Konkokyo during summer vacation. I decided to go to these training sessions and learn tengaku. I went to worship at the Konkokyo Headquarters. At the Mediation Place located at the Konkokyo Headquarters’ Central Worship Hall, I spoke to Konko-sama, “Konko-sama, I’d like to start to learn tengaku from now. I want to learn, for instance, how to play the shoe this year and how to play the dragon whistle next year. I want to learn how to play various musical instruments and become an almighty player.” Konko-sama smiled and replied, “Wow! How nice!! Everything needs practice, you know.” Konko-sama continued, “We, humans, do various things everyday as if it is a given that we should be able to do them. But the truth is that we can do all those things now because we practiced in the past. Just reflect about it. Babies cannot do anything by themselves. Walking, talking and everything else are what we have learned to do. We were able to learn them because our parents and many others taught us how to do them. We practiced. We made mistakes during our practices. And we practiced again. Then, we gradually came to be able to do things on our own. The Fourth Konko-sama taught me the importance of practice and also the importance of a thankful heart, even quoting his past episode of practicing how to urinate well. He guided me with simple, plain words so that even a middle-school student could easily get it. Until I received this Sacred Mediation from Konko-sama, I had considered Konko-sama as a bit of a scary person. Because of this, I felt a bit intimidated when I approached the Mediation Place of the Konkokyo Headquarters’ Central Worship Hall on that day. I, however, liked Konko-sama very very much as soon as he gave me this Mediation. My father, in fact, was sitting right beside me when I received Konko-sama’s Mediation on that day. He was listening to Konko-sama’s words, sitting next to me and bowing very deeply. Father talked to me later on, “You were given wonderful teachings today, weren’t you? Make sure that you will remember what happened to you today for the rest of your life. You may ask me why. 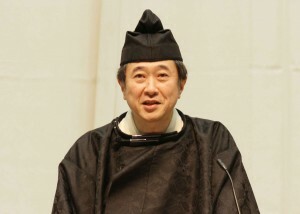 It is because this is the first ever teaching that you received directly from Konko-sama.” It is my assumption that father earnestly listened to what Konko-sama had to tell me and took those words seriously and deeply into his own heart, as if the teaching was being directed not only toward his son but also toward himself. Back in those days, father not only did goyo (sincere, selfless service for Deity/Kami) at our church but also took care of my aging grandparents. Grandpa had a severe dementia, and we literally had to keep our eyes upon him all the time. Grandma was also a physically fragile lady, and she could hardly see from the time when she was much younger. In addition to these difficulties, father had a terrible lower-back pain coming from disc herniation, while mother had a weak organ in her body and tended to be sick in bed due to her weak heart. These events happened more than forty years ago, and we did not have long-time care services for the aged and/or handicapped just as we do today. Because of this, it must have been an extremely hard job for my parents to take care of my elderly grandparents every single day. At times, mother voiced words of complaint almost despite herself. Whenever mother uttered complaints, father would respond, “Take it easy, sweetheart. Even if you are sad enough to shed tears and even if you are frustrated enough to shout aloud, you and I still need to take care of our parents. If we must take care of our parents no matter what, why don’t we try to do so with a happy and joyful heart?” With these words, father would cheer up mother. Father would often continue, “People usually take care of their aging parents with or without a religious heart. If we find it honorable to have an opportunity to take care of our parents and are willing to take care of them, we will be training ourselves spiritually. Kami-sama (our Parent Deity) must be worrying about the lack of our divine virtue, and I guess He is supplying us with a chance to give ourselves religious training.” Father often said so to mother, as if he were also trying to convincing himself. As a result, my parents undertook the severe yet spiritually worthy duties of taking care of their elderly parents day in day out. Because of this, Konko-sama’s words of “Everything needs practice” and “You need to be thankful enough and practice hard” must have truly encouraged my father.a whole lot. Back in those days in the 1970s, if a home had a family member with dementia and/or physical handicaps, they tended to feel ashamed of having such a family member and they often tried to conceal the presence of such a family member in their home. If a Konko minister said, in those days, that his Head Minister was sick, people may have wondered “Why does a Konko church’s head minister have to suffer such a misfortune despite practicing faith in a deity?” Or, it may have been also possible that the sick parent criticized his/her son, “How dare you say something that embarrasses your parent terribly!” In such an era, my father positively talked about his sick parents in his church and outside of it as well. By talking about this subject, father referred to the meaning of life and joy deriving from spiritual developments. He learned the meaning of life and joy coming from his spiritual developments through his first-hand experiences of looking after his aging parents. Aging, sickness and death tend to be regarded as dark, tragic things if they are not considered more deeply. My father, on the other hand, often talked about these “dark” topics, casting a bright light upon them and showing people that these were the things happening amidst our Divine Parent’s sincere wishes and warm, caring thoughts. No one can avoid aging as long as we are kept alive, and my father was no exception. He became more and more forgetful as he grew older. One day, father had his brain examined in detail at a hospital. The result of the brain examination showed that my father’s brain was severely atrophied. It was evident that father had dementia. On the very next day of the brain test, father happily spoke to several worshippers who came to our church for morning prayer service. “I took a so-called a test yesterday after a long, long absence. Well, it was not a difficult exam. It was rather easy, because the worse your score is, the bigger chance for passing the test you will get.” The worshippers in the church were amazed to hear that, wondering if there was really such a test. Father continued, “It’s nothing big, everyone. It’s in fact a test for dementia. I took it and passed it exquisitely. Now I am officially acknowledged as a person with dementia. I began to take medicine for dementia this morning. This happened to me as a proof that I have been kept alive for such a long time, being given life by our Divine Parent every single day. For this, I am deeply thankful.” Saying so, father looked happy from the bottom of his heart. Due to the nature of the test he had taken, the worshippers just couldn’t say “Congratulations on passing the test!” to their Head Minister. They didn’t know how to react to my father’s words. In this way, father accepted his sickness, obviously looking unconcerned. I deeply admired the way my father was, and it helped me feel proud of him. I spoke to people around me about my father’s symptoms. My father suddenly looked very serious. “OK, listen, Makoto,” he said. I silently said to myself, “Darn! Did I perhaps make him angry” Father said, “A Konko minister is expected to serve people as a useful human resource. As long as you are useful to the people around you, the way you are useful does not matter. There is no reason for you to be shy about it. Go and talk about me as much as you want.” As you see, it was evident that father is truly devoted to serving our Divine Parent. Father has this unshakable belief: “Even if I get dementia, or even if I become totally bedridden, our Divine Parent will continue to use me as long as I am kept alive. My being alive means that Kami (Deity) has roles for me to fulfill in this world.” Thanks to this firm belief, my father is able to gladly accept his aging and sickness. He can stay positive and cheerful. With an attidued of playfulness, father additionally said to me, “This sort of things happens in order. You will have your turn sooner or later.” And he laughs mischievously. In the past, my father would talk about my grandfather’s dementia often. I now talk about my father’s dementia. Next, maybe I will have my own dementia. Maybe yes, maybe no. Who knows? Later on, my father began to suffer from Parkinson’s disease as well. He found it difficult to move his body freely. Father came to the point where he could not stand up and walk by himself. It must have been a very tough situation for him, but when a doctor asked my father, “Don’t you have pain anywhere on your body?” he replied, “Well, everybody comes over to and takes good care of me. I know I am the happiest man in this world,” shedding tears of joy and happiness. Father, in fact, had pain everywhere on his body. I say this, because father needed two persons who held him on both sides so he could enter the examination room. He took a lot of time just to take a seat, enduring pain. But delight seemed to fill up his heart, and it seemed to cancel the pain in his legs and lower back. Time passed and father could no longer use his hands freely. He now needed aid when he took his meals. Scooping food with a spoon to feed my father, I would ask, “How do you feel?” And father would reply, “I feel like I am a king, and it sure feels good.” When he was fed by someone, he felt like he was a king, according to my father. Not all people may feel this way. Some may think, “Oh, dear… I can no longer enjoy my meals by myself. I always need someone that helps me eat my meals. What a sad and miserable situation I am in,” and they may grieve over their difficult situation. My father, on the contrary, was not filled with such a miserable atmosphere at all. Father’s Parkinson’s disease advanced as days went by, and he was finally bedridden on a constant basis. He gradually lost words, and during the final few months of his life, he was only half conscious. When we talked to him, father hardly showed reactions. Father, nevertheless, seemed to regain his consciousness and listen to me quite attentively when I spoke to him about Sacred Mediation done at our church. I reported to father lying on his bed, for example, “Today, Mr. A came over to our church for Sacred Mediation. I listened to his requests at the Mediation Place and spoke to him about what was on my mind. Please pray to our Divine Parent for Mr. A so that he can receive Kami’s blessing.” When I said so, father’s eyelids moved just a bit. When I saw the slight movements of father’s eyelids, I was sure my messages reached my father. That was pretty encouraging to me. The members of our church all said, “We truly want our Head Minister to live as long as possible. He doesn’t have to do anything for us. We are thankful enough as long as he is alive.” In this way, my father, our Head Minister, was depended upon, admired and loved by everybody and he passed away peacefully and quietly in January 2016. My father often said, “When we do something that has to be done, why don’t we try to do it with a happy and thankful heart? That’s spiritual training, isn’t it?” Saying so, father continued to train himself, trying to perceive Kami’s heart in everything that happened in his daily life. Father’s continuous self-training rewarded him later on. He was allowed to spend the last years of his life in such a mentally rich environment and leave this world, giving his family and church members nothing but happy and thankful feelings towards him. The Founder teaches us, “No matter how well-educated or how smart you are, merely having knowledge about the faith of Kami is not useful. You cannot receive Kami’s virtue unless the teachings of the faith are deeply absorbed into your heart and your faith is expressed in your life.” (GIII: Jinkyukyogoroku 151) If you try to put teachings into practice day after day after day, those teachings will be deeply “absorbed” into your heart, and the teachings will really work for you. The Fourth Konko-sama practiced saying “Thank you very much” to everyone and everything that took care of him day by day. As self-training of spirituality, he said “Thank you very much for taking care of me” to a pair of his wooden clogs, his glasses, his writing brush and his ink stone every single day. In the case of the Fourth Konko-sama, he additionally utters his appreciation, for he feels that he already receives Kami’s blessings by practicing expressing his gratitude. When the Fourth Konko-sama said to me,”You can practice because a lot of people take care of you,” I was a middle-school student. Konko-sama meant it when he gave me these words. He was able to mean it because that was exactly what he was trying to convince himself on a daily basis. I didn’t realize it when I first heard him say so, but now, I really appreciate the divine virtue of the Fourth Konko-sama that was reflected in the above-quoted words he kindly gave me. The Founder, the successive Konko-samas, the Founder’s First Disciples, ministers with outstanding contributions to the Konko Faith propagation and many other senior Konko believers have shown us their constant efforts to train themselves religiously and the undoubtedly certain fruits/blessings such sincere endeavors brought to them. Lastly, I humbly state my hope that we will renew our wish to follow their venerable path of faith, that we will let people know the joy of life with the Konko Faith and that we will help Kami (our Parent Deity) realize Kami’s wish in this world.